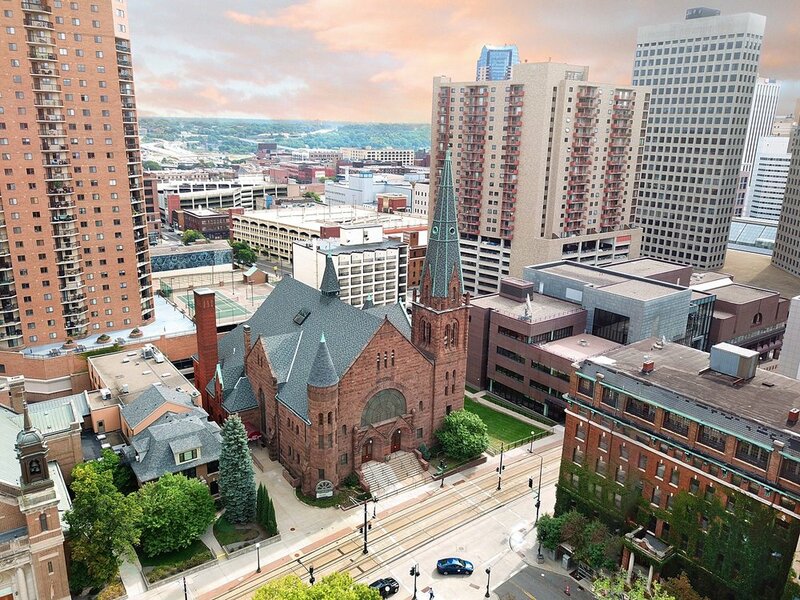 Central offers free parking at the World Trade Center Ramp, located just across Cedar Street from the church at 447 Cedar St., Saint Paul. Take a ticket and park. Then, get a chaser ticket to replace it from a church usher. If you are using this ramp, please note that there are two entrances to it — one on Cedar and one on Wabasha. Handicap accessible parking is available in the Minnesota Public Radio Lot (behind the church, off 9th and Minnesota). On Sundays, we are allowed to use the full lot with the the four spaces nearest the church entrance reserved for handicap parking. There are four spaces in the Minnesota Public Radio Lot (9th and Minnesota) that are designated for Central use all day, every day. They are marked with white signage nearest the church door. This door is secure. To gain entrance to the building, please ring the door bell to be let in, then check in with the administrator in the office on the main level. Parking is available at the following locations. Click on the link to see rates. Central is unable to provide free parking for non-church (non-worship) events. Central Presbyterian Church is on the Green Line! Get off the train at the 10th Street Station and walk south less than one block. The church is located at 500 Cedar Street between 9th and 10th Streets. Take 1-94 East to the 10th Street exit. Stay on 10th Street for 3 blocks. Turn right onto Cedar Street. Go one block to the brownstone church on the left. The World Trade Center Ramp is just past the church on the right. Take 1-35E to Kellogg Blvd/11th Street-State Capitol Exit. Follow 11th Street 3 blocks to Cedar. Turn right on Cedar Street. Go two blocks to the brownstone church on the left. The World Trade Center Ramp is just past the church on the right. Take I-94 West to 12th Street/State Capitol exit. Stay on 12th Street for 4 blocks. Turn left on Cedar Street. Go 3 blocks to the brownstone church on the left. The World Trade Center Ramp is just past the church on the right. Take I-35E to University Ave/State Capitol exit. Cross University to 12th Street, stay on 12th to Cedar Street. Turn left on Cedar. Go 3 blocks to the brownstone church on the left. The World Trade Center Ramp is just past the church on the right.